I’m a pastor. I am also in charge of programming our weekend services for our High School Ministry at Saddleback. Something that I want to do the best I possibly can. The pastor in me loves relational ministry: getting coffee, hanging out after services, and eating together. Jesus was all about having relationships with people. But I am also a programmer and need to focus on the program as part of my job. So I want the lights to be just right, I want the smoothest transitions possible, I want the sweet videos, I want a professionally ran service so it looks and feels smooth to create an experience for students to meet Jesus during services. So which am I? A pastor? A programmer? A programming pastor? The way I like to think of it is…I am a pastor, who happens to programs a service. I don’t think it is an “either/or” type of situation. The tendency is to think that we have one or the other. 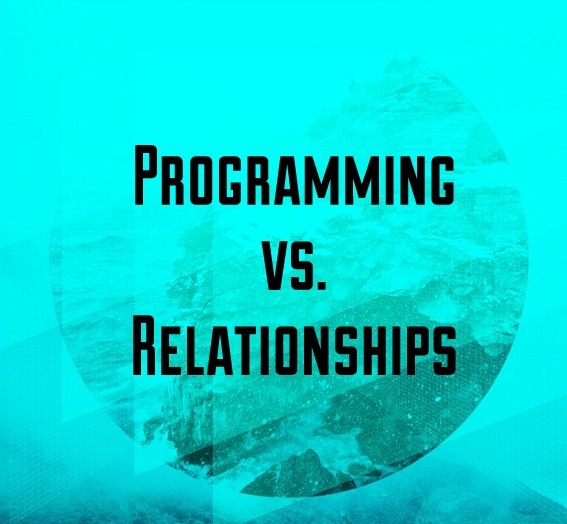 We either can focus on the programming side, making sure the service is flawless, with cool elements, and illustrations, but then the relationship side would suffer because all of our focus is on the service, and the ministry would be super shallow. Or there is the other way, where relationships takes completely over, where you will have really deep relationships with students, but the service will suffer and be sloppy and boring, and friends of the students wouldn’t want to come because they think it is “boring”. I feel like this battle is within us and is constant. It may or may not be true for every ministry, but I know there is a balance that we need to be aware of. One of my favorite times on the weekends is the 5-10 minutes before service starts as students are sitting down and just going around meeting and talking to people. I love it. Being a pastor, it would be obvious that I am relational. I think this is the number one thing when it comes to student ministry. Being relational and being authentic in that relationship is the number one thing students’ want/need. If you do not have the relationship side down, there would be no kids to put on a service for. The service itself is important yes, but it means nothing if we don’t have relationships to go with it. “Real ministry” happens the 15 minutes before and after the service, and the service is just helping them sit and focus on the area you are speaking about so you can then do the “real ministry” (the prayer, the hanging out, the conversation about what stood out to them, etc.) afterwards. Without relationships, we are missing the purpose that Jesus came to earth for us…to have a relationship with us. But what about the service? If we have a boring service, then they wont bring their friends? They will be bored to death and won’t come back! These are real questions that I have thought myself. I fall into this way of thinking, but it also is my job to run a successful service. This is something I want to unpack next post. [Question] What do you do on the relational side? Where are some of the best places you hang out and have those “real talks”?